Tip...if you use carrots, at least until 1.8.1, change to something else in your hand before the breeding can begin. If you wait too long to do that, they may not breed. It's easier to use dandelions, which work the standard way. Also, rabbits have to become friendly, first, like cats or dogs, before they'll breed. You may have missed feeding them twice when you were trying to crossbreed. They get hearts the first time, but won't breed until at least the second time. I always do the ponds, too, for the same reason. Okay, I'm going to take the next round of this one. It's going to be interesting to see how the map has changed since I first looked at it -- this was the first RR I did. EDIT: Linda, when I went into the game, you had left your armor on. I took it off and put it in your chest. You were one slot short so I took a stack of dirt out and put it in the storage chest on the top level -- there is plenty in there. Hope you don't mind. I think I may have done that in at least one more map, too! What you did was absolutely fine. No worries at all. 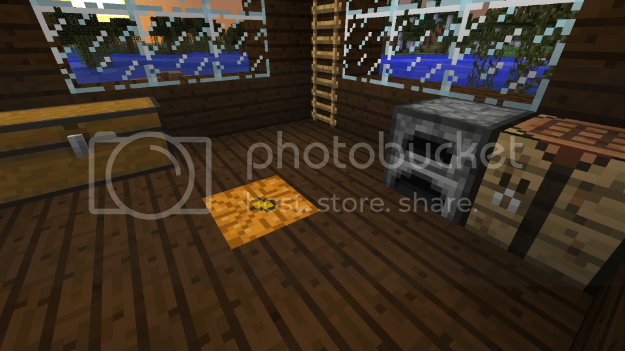 I should have just dumped the dirt and cobble in the first place. I always carry some with me, but they don't really need to be stored in my inventory...they're generally easy to find, plus we fill those chests up in a hurry! Have fun with Round 4!!! Okay, I need a referee call. I just finished breeding all the animals. I did the horses and donkeys last since they were the hardest. I bred the horses (a gray spotted one with a black one -- the only two horses there) and got a black spotted horse as the baby. Then when I went to breed the donkeys, I must not have gotten my finger off the mouse fast enough because it fed both my golden carrots to the same donkey. 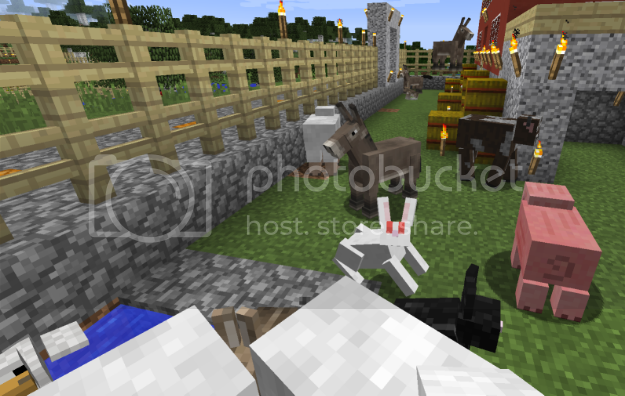 So I went and made more golden carrots and came back and bred the donkeys. I was then going to take a pic of the horses and donkeys, but when I was looking around, I couldn't find the new horse. I looked in the pens, the barn, outside. He's nowhere to be found. So, do I need to breed again for the challenge or did that count? That counted. Circumstances beyond your control! I forgot to mention before, that the game is producing foals as full-grown horses in size, but you can't tame them until they are actually adults. Okay, glad it counted but I don't like losing horses. I have now finished the challenge. (1) There's a great place for a dock, on the beach which can be found at 188 63 2228 Build a dock there--using any materials you like. I built the dock a couple of blocks to the left of those coords (which are actually 2000 off on the Z coord) so that the dock could hook up with the road that was already coming in that direction. 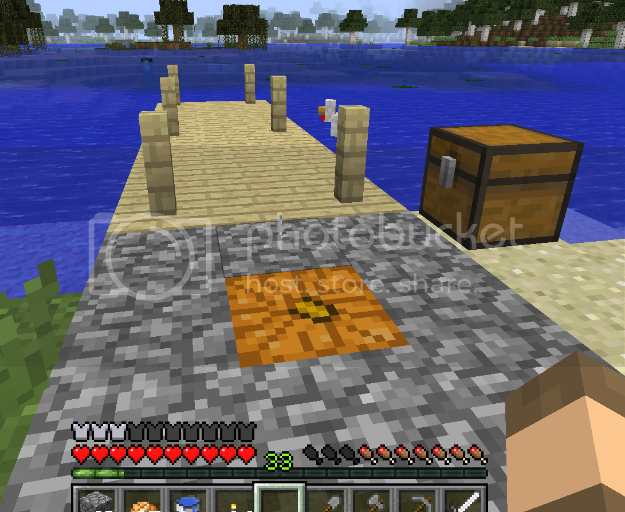 Here you can see that I have the six boats in the chest and in the pic above you can see that the chest is next to the dock. I didn't put it "on" the dock since that would take up too much room. 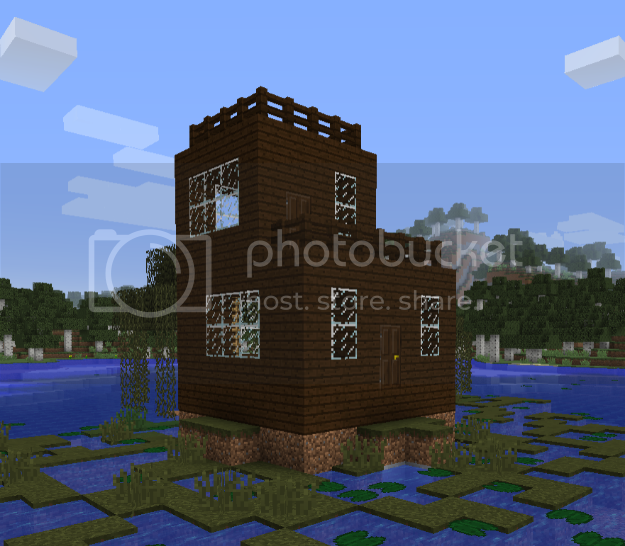 (3) ...the fishing and slime-hunting lodge. Pretty much straight out from the new dock, you'll find a part of the swampland that has a nice pad for building a safe and secure lodge where players may go to fish or to hunt slime. Build the lodge and make sure it has a sniping area on the roof that is above the reach of a witch (a couple of floors tall, at least), because the witches DO turn up out there! Be sure to put at least one double storage chest out there, and a basic crafting area. I made the hunting lodge two stories tall. I put a deck on the second floor and on the roof of the second floor, so you can be up as far as you want when sniping. I lit up the inside of the lodge with jack-o-lanterns, but I didn't put any lighting outside so as not to scare away anything that is being hunted. I put the double storage chest and the basic crafting area downstairs, along with a table with some cake on it for hungry hunters. There is a bed upstairs in case you need to spend the night. (4) There's a hidden chest very close to that building pad (hint...neither fire nor water will destroy a chest and its contents). The hidden chest took me over three MC days to find. It was hidden under a lily pad and had dirt around it so you had to be coming from the right direction to see it. I was searching in the other direction for a long, long time. 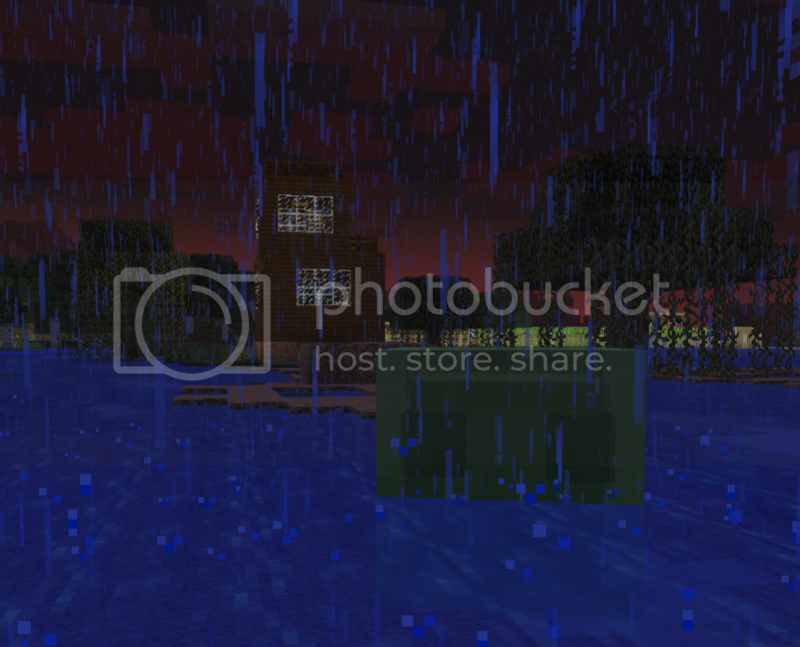 (5) The slime like to spawn at least 24 blocks away from players, yet not much further than that, in swampland areas. That gets kind of tricky. The "maze" around the building pad is a little small. 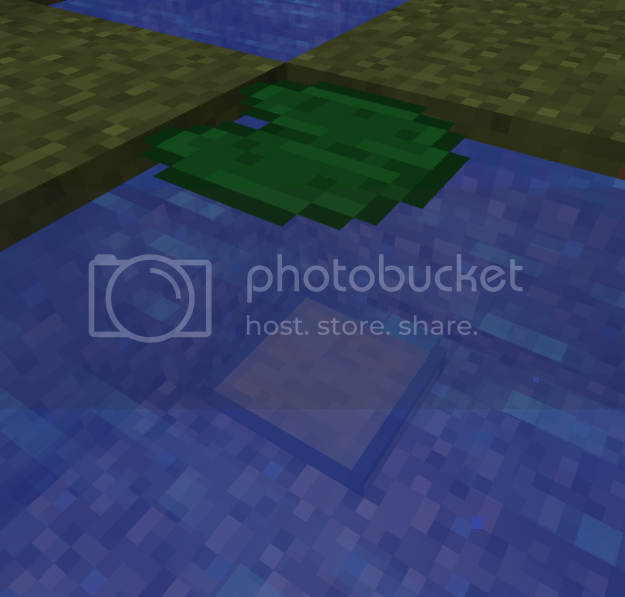 Check out the land/water configuration out there, and add to the maze with enough dirt blocks to make pretty sure that slimes will like the new area. (6) Spend a couple of nights out there (not on moonless or new moon nights--it will be time wasted--the bigger the moon, the bigger the chance of seeing slimes spawn). If slimes appear, please get a photo, and try to get at least six slimeballs to put in the storage chest over there. I'm going to do 5 & 6 together since they both involve slime and slime was my biggest adventure of this challenge. First, I was waiting to see if any slime would appear where I had built out the swamp by the lodge. Nothing was popping up so I decided to go over to the swamp to the west just beside the lodge. There I finally saw two large slime and decided this was the perfect opportunity to get my pic and grab some slimeballs for challenge 6. After taking the first pic, I wasn't sure if anyone would be able to make out the slimeballs since they were so far away and it was dark so I decided to wait until they got a little closer. And they did come closer, as did the skeleton that had been pelting me with arrows for a bit. 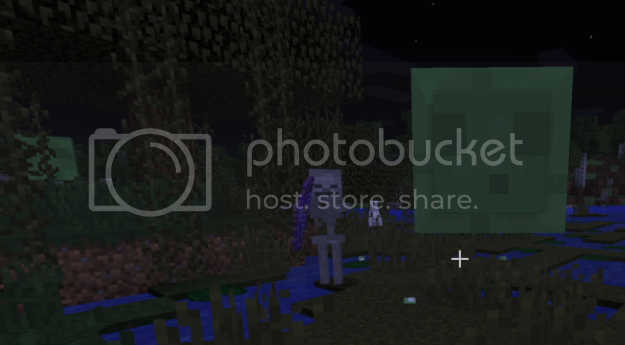 I snapped this pic just before the skeleton managed to kill me. I had saved at the lodge a few nights before, so I materialized there, but even that was too far away and by the time I got back, the two slime had despawned. Since this was the last night that was decent for slime hunting, I had to wait for another cycle of the moon before I could try again. This time, I actually had a slime spawn on the area that I had created around the lodge, so that took care of challenge #5. But I only got 4 little slimeballs from this guy so I had to try again. I went over to the other area which is larger and had more slime spawning and I saw a medium sized slime and went to get it. But it was just far enough away that by the time I got there, it had despawned. That was it for that night. The next night I came back and there was another medium sized slime. I managed to kill it this time. But only got 1 little slimeball. So now I was still short by 1. I waited and had the opportunity to kill another medium slime and got 1 slimeball from him -- again, not a lot, but enough to finish the challenge. So then I headed back over to the lodge to put the slimeballs into the chest before anything happened. 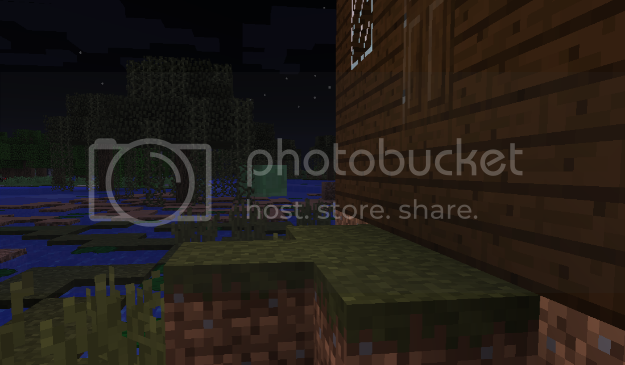 On the way back, I saw this guy who had spawned in the area I built by the lodge. Can you guess that when I killed him I got 13 -- yes, 13 -- slimeballs? 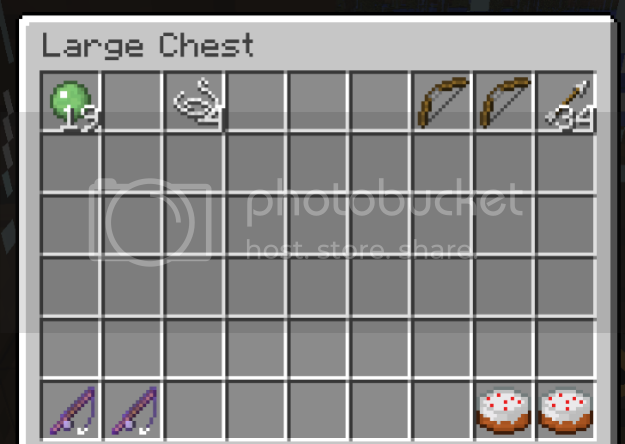 (7) Also craft (or inherit from some skeletons) two bows, and provide at least a dozen arrows in the storage chest. Yeah, the bows and arrows are in there (but check out all those slimeballs). (8) Breed each of the animal species at least once, making sure you don't let any of them out of their pen! You may slaughter if you need supplies (armor, arrows, etc. ), but be sure you don't leave the game with less than two of any animal in the barn!!! As I already mentioned in a post above, I lost the horse I bred. Sooooo sad. But here is a baby bunny. And here are some more pics of the animals although I don't know if any of the babies are in the shots. Mostly this is just to show we have a lot of animals now. And the barn and surrounding area is so much nicer than all the pics show. Great job with that, Linda. 1. We have a dock, now we need a boat. Not a giant sailing ship, just a good sized cruising down the river kind of boat. 2. 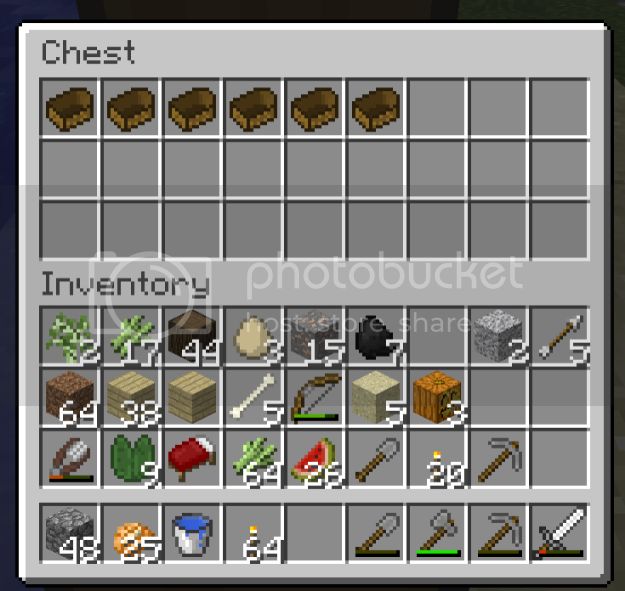 We need supplies so that we can trade with other towns as we pass them down the river, so put a chest in the boat and have 1 stack of iron, 1/2 stack of gold, 16 pieces of lapis lazuli and 16 pieces of redstone. Also include 1 stack of potatoes, 1 stack of carrots, 1 stack of watermelon slices, 1 stack of wheat and 1/2 stack of pumpkins. Woot! You did a great job, Lydia! I'm sorry I mistyped that coordinate for the dock! Sheesh! It should have been 228, then...right? You did exactly right! Oh, the adventures we have, in order to get those little slimeballs! The hunting cabin looks great! Picking up the map, now. Oh, I think I left my iron chestplate on. If I did, anyone can keep it if they want. Lydia--I just discovered that the new map didn't evidently upload all the way. It's only 1.6 MB, and the zip won't open. Either the zip messed up when it was archiving, or the upload messed up when you were ftping it. I've tried downloading it twice, now, and it was the same both times. Just saw this. I'll upload it again. It seems to be right, now. It said it was going to be a 28 min. download (which it probably won't be). I've scheduled it to come in after 2 AM. Thanks!